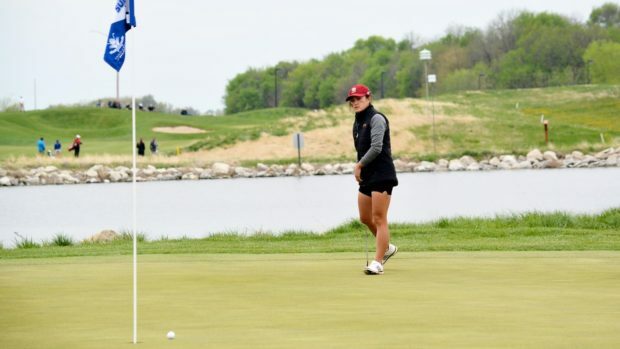 NO TWO GOLF SHOTS are ever the same, but some arise less frequently than others—and when they do, “blowup holes” can result. 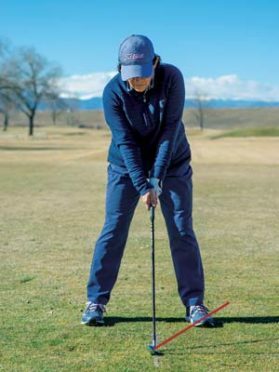 Instead of hitting the same shots over and over on your next trip to the range, set aside some time to master these tricky stroke-savers. 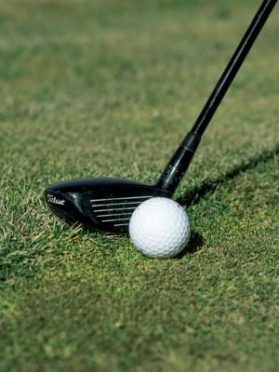 Although each involves a different situation and different club, they all share the technique of shifting your weight forward and requiring practice to master. 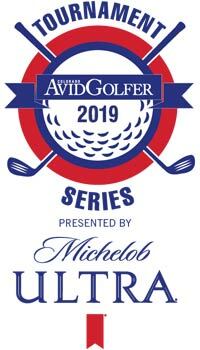 Situation: When you’re up against the fringe, just barely in the rough or within 30 yards and there’s no hazard between you and the hole, a hybrid with 18- 22 degrees of loft will give you more lift than a putter (4 degrees) and far less than a wedge (46-60 degrees). 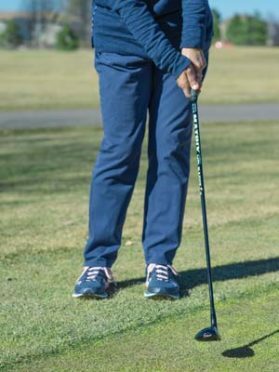 Use normal putting grip and choke down on the club because a hybrid’s shaft is much longer than a putter’s and gripping down will give you more control. Press the handle forward. Position the ball off back foot and shift weight to your front foot. 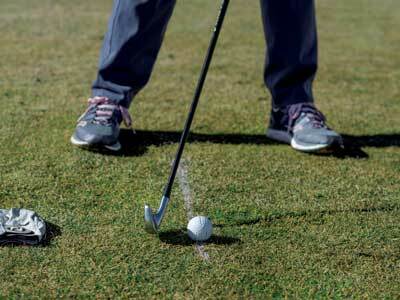 Feeling pressure on your forward foot from the start of the swing to a held finish, take your normal putting stroke. Situation: On blustery days, you need to keep the ball low and under the wind. Set up by playing the ball back of center with your weight and hands forward. Notice the difference in the red launch angles in the two images below. Ball in center of stance produces “normal,” but too-high ball flight. Back of center produces desirable “low” ball flight. 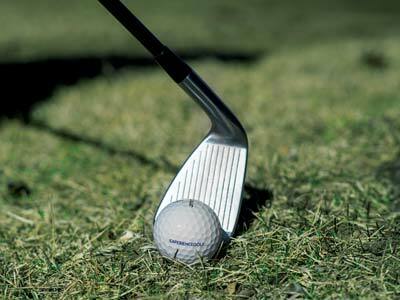 Also, to keep the ball low you have to control and keep the club de-lofted at impact. 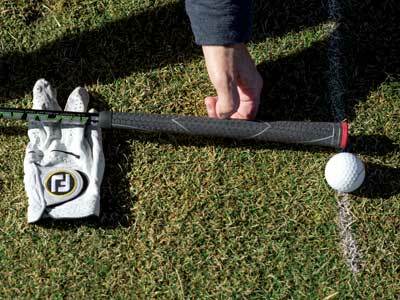 To practice this, put a glove one grip behind ball. On your takeaway (above) and downswing, do not hit the glove. 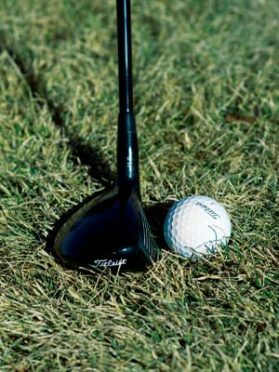 This promotes a descending angle of attack, removing the wrists from the swing and keeping the hands ahead the clubface at impact. Follow through strong with a low-held finish. Situation: How to extricate a ball that plugs in a bunker. 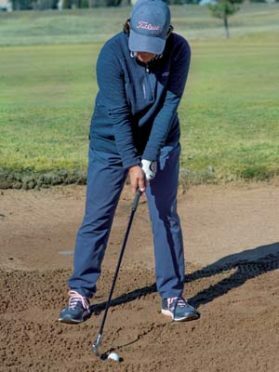 You want the club to dig, rather than glide, through the sand, so you need to use the leading edge of your sand wedge so the club pops the ball up and out. Setup: Position ball in the center of your stance. 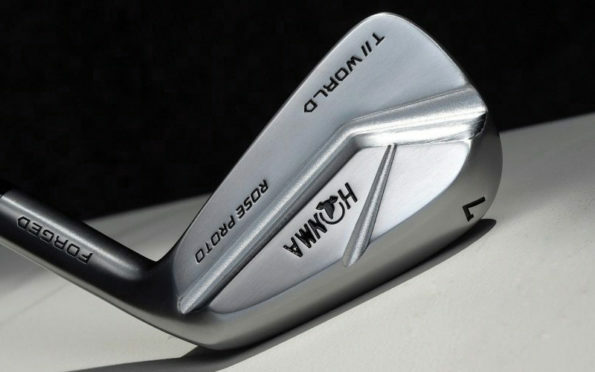 Close the clubface. Drop lead shoulder and lean forward. 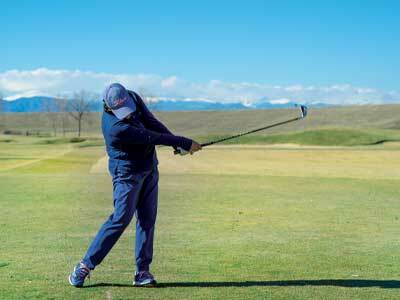 Swing steeply and swing aggressively, maintaining a V-shape with your arms. 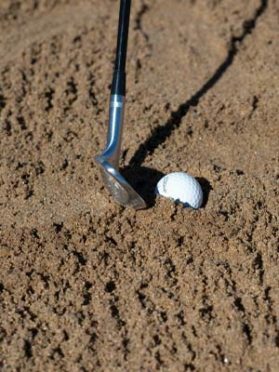 Strike the sand just behind the ball, digging in and popping out the ball. 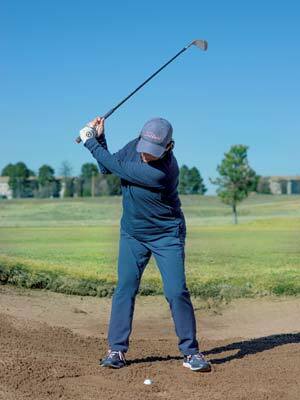 Follow through, but know that digging into the sand will prevent a big finish and the ball will run once out. 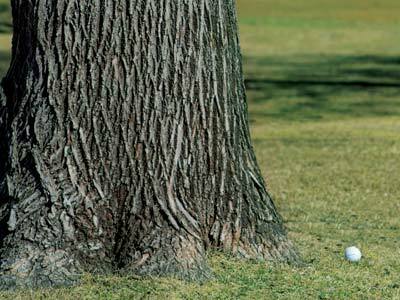 Situation: You don’t have a stance because the ball lies against a tree or course boundary. Invert the club, so the toe points towards the ground. 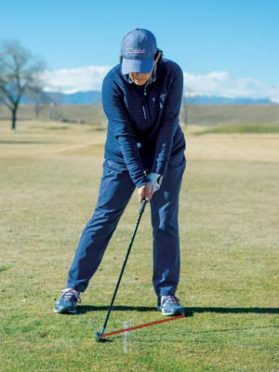 If you’re right handed, set up as if you were a lefty, putting the ball back in your stance and shifting your weight towards the target. You need to practice his shot to feel comfortable with it. 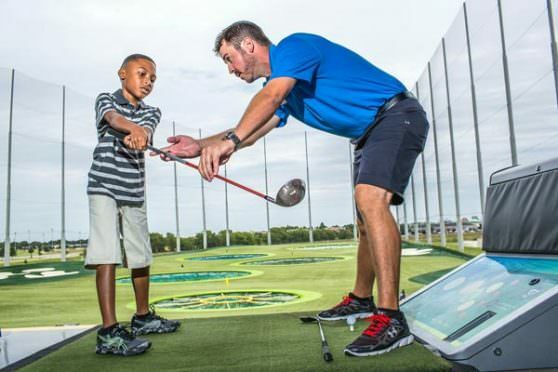 Take a small, controlled swing. This is not the time for a hero shot. 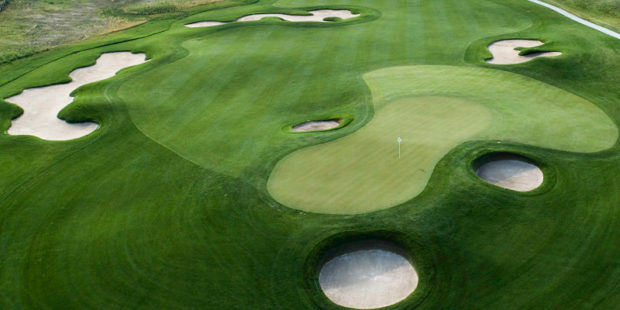 You just want to get the ball to a playable spot. 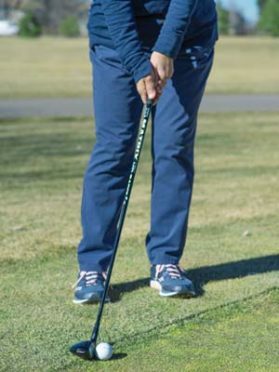 An elite teacher, LPGA Class A Professional Elena King is president of ExperienceGolf and director of instruction at Aurora’s CommonGround Learning Center. 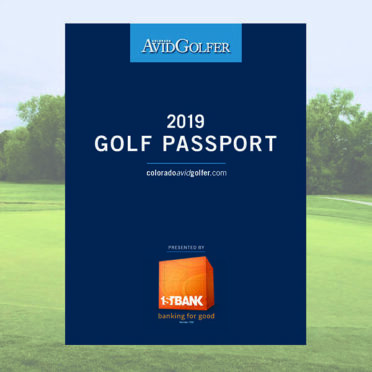 experiencegolf.biz; 303-503-0455.